With China becoming the biggest automotive market in the world, car manufacturers around the world take advantage of this year's Beijing Auto Show in order to reveal their latest creations. Some of them even gone a few steps forward by debuting limited edition models built specifically for the Chinese automotive market. One of these manufacturers was Aston Martin which revealed the Aston Martin Dragon 88 Limited Edition package. The 88 Limited Edition package will be made available for multiple Aston Martin models, including the DBS Volante, V-8 Vantage S Coupe and Virage Coupe. The 88 Limited Edition package celebrates the Chinese Year of the Dragon and consists in only 88 cars, which interestingly enough, is more than half of what Aston Martin managed to sell the entire last year in China. The package includes unique features on both the interior and exterior, such as 24-karat gold badging, a new 10-spoke alloy wheels with silver finish and unique black brake calipers on the exterior, whilst the interior has been enriched by dragon-embroidered headrest inspired by the Nine Dragon Wall, a Bang & Olufsen speaker system, Piano Black trim and three interior color schemes including Chancellor Red, Spicy Red, and Deep Purple. As far as the exterior color choices goes, the Limited Edition offers three colors including Amethyst Red which symbolizes wealth, protection, peace and intuition, Volcano Red symbolizing the fire of the dragon and Champagne Gold which represents the dragon's prestige, wealth, fortune and status. As for the pricing, the British automaker hasn't revealed any information just yet, but it's expected that Aston Martin Dragon 88 Limited Edition will shed some light on the subject soon. 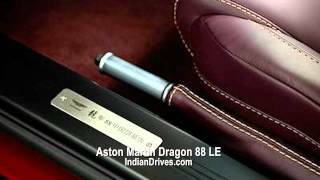 Nevertheless, we're expecting the Dragon 88 package to have a pretty high price and we'll just have to wait and see whether or not it's going to have the same success as the Year of the Dragon Edition Rolls-Royce Phantom which sold out a few months ago at the price of $1.2 Million apiece.